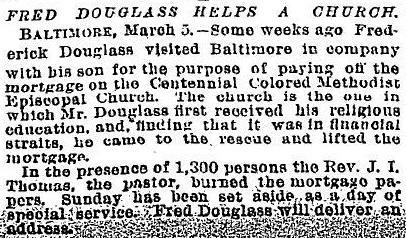 FRED DOUGLASS HELPS A CHURCH. Baltimore, March 5. – Some weeks ago Frederick Douglass visited Baltimore in company with his son for the purpose of paying off the mortgage on the Centennial Colored Methodist Episcopal Church. The church is the one in which Mr. Douglass first received his religious education, and, finding that it was in financial straits, he came to the rescue and lifted the mortgage. In the presence of 1,300 persons the Rev. J.L. Thomas, the pastor, burned the mortgage papers. Sunday has been set aside as a day of special service. Fred Douglass will deliver an address. When Frederick Douglass moved to Uniontown, horse thieves, wild animals, and escapees from the Government Hospital for the Insane roamed the pastoral roadways. In just over twenty years since its founding the suburban subdivision of Uniontown, and the adjoining villages, had seen the erection of school houses, churches, stables, new homes and businesses, and meeting halls. Douglass was no stranger to this community. 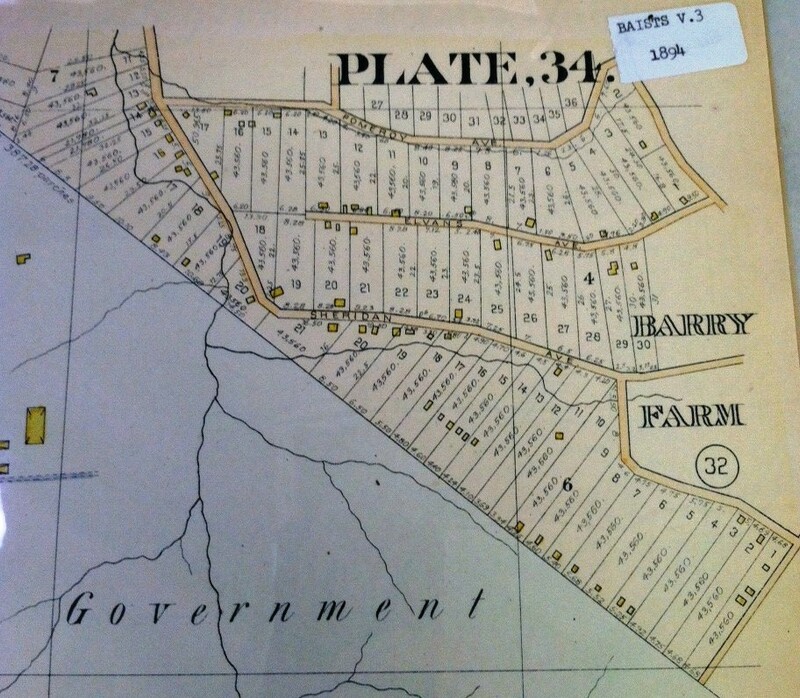 The next neighborhoods over from Uniontown were known as Potomac City, Hillsdale, and Barry Farm (developed by the Freedmen’s Bureau); the last two names remain in currency today. With more than $50,000 set aside by General Oliver Otis Howard, head of the Freedmen’s Bureau, in a trust to develop “normal collegiate institutions or universities” these funds were used to purchase 375 acres from the descendents of James D. Barry in 1867. Sitting just beneath the Government Hospital for the Insane, which saw its first patient in 1855, the sale of lots would help relieve “the immediate necessities of a class of poor colored people in the District of Columbia.” Within two years, more than 260 families had made Barry Farm their home, the Douglass boys included. And there, all three of Douglass’s sons initially settled upon moving to Washington in the late 1860s, a testament to the family’s creed and commitment to being on the front lines of uplifting their race. Charles and Lewis would move across town while Frederick, Jr. would spend the rest of his life on nearby Nichols Avenue, today Martin Luther King, Jr. Avenue. In the early years of the 1870s, when in Washington to run The New National Era and serve on the Legislative Council, records indicate Frederick was living in the Anacostia area with one or all of his sons.